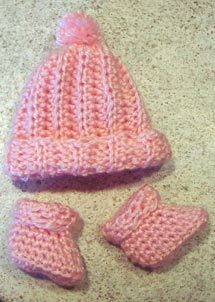 Hat and booties are crocheted with 100% acrylic yarn. They are available as a set or can be sold separately. 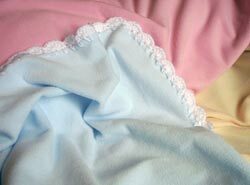 They come in white, soft yellow, soft pink and soft blue. Blankets are made from a soft fleece fabric and edged with a shell crochet stitch. Blankets typically are 20x20 inches for the average dolls, slightly larger or smaller if needed. The blankets are available in pink, blue or yellow.